A gardener who owns a greenhouse has the capability of extending the growing season by a few months each year. There are even a select few greenhouse gardeners who can get away with growing year round without adding a heating system. In most climates, however, during the winter months the nighttime temperatures become too cold for most plant species. In order for most greenhouse hobbyists to keep the greenhouse operational year round, some sort of heating system will need to be added. The three most common ways to heat a hobby greenhouse are with gas, electric, or passive solar heat. Heating a greenhouse with gas is the least expensive option. The cost of heating a greenhouse with gas is the main advantage of gas heating and is the main reason people choose gas heating over other options. Beware of open flame heaters for greenhouse applications. These heaters will emit ethylene gas which can affect budding plants, such as orchids, to the point where their blossoms will not form or will fall off altogether. The other problem with open flame heaters is they have safety oxygen sensors which will automatically turn off the unit when depleted oxygen levels occur. This is a great safety feature for a heater within a home but in a greenhouse it can cause some problems. Many of the newer greenhouses are practically air tight which means they can get depleted oxygen levels fairly easily. If the heater turns off during the night, all the plants in the greenhouse could perish. Gas heaters that have a flu and are power exhausted are the best for greenhouse applications. These heaters will need to have a hole punched into the side of the greenhouse for the exhaust. All in all, an average gas heater for a greenhouse runs at 80% efficiency (mainly due to the heat loss through the exhaust ports). Because there is no need for ventilation with electric heat, this type of heating is the most efficient. Electric heating runs at 100% efficiency. 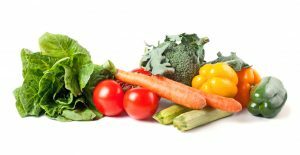 However, electricity is expensive and heating a greenhouse year round with electricity alone may be too expensive for many gardeners’ greenhouse budgets. However, there are some ways a gardener can supplement heat naturally to offset some of the cost of heating with electricity. For example, passive solar heat can be used to offset some of the cost associated with electric heating. If you do choose to go with an electric heater, it is best to get a 240V heater which will have plenty of heat capacity. Over the long run, 240V units save money and are very reliable. If you must go with a 120V unit, try to avoid infrared heaters or heaters that transfer heat to objects instead of heating the air. 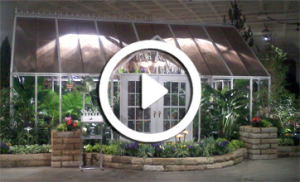 For greenhouse applications, a gardener will need a heater that will heat the air within the greenhouse. The best inexpensive 120V heaters for greenhouses are the oil-filled radiator-style heaters. If placed near a fan, these small heaters can adequately heat some small hobby greenhouses during the winter months. Passive solar heat refers to collecting heat from the sun’s radiation during the daytime and releasing that heat into the greenhouse during the nighttime. This is usually done with water or some other thermal mass that is capable of absorbing and holding heat for a duration of time. 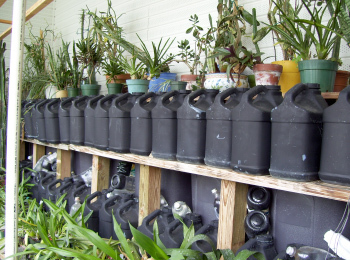 One technique is to line the north wall of a greenhouse with black water containers. When placed on the north wall, these containers will not shade light from reaching the plants in the greenhouse; instead, they will absorb light and heat that passes through the greenhouse to the north wall. When the sun sets, the heat that is held by the water will slowly dissipate into the greenhouse environment. When passive solar heat is used in conjunction with electric heat, it can significantly reduce the annual cost of heating a greenhouse. of the greenhouse to act as Passive Solar Heat Collectors in the winter.